Posted on November 21, 2018. Subscribe to our blog by email. Summit participants with Marta Sanchez. Photo: Movimiento Migrante Mesoamericano. 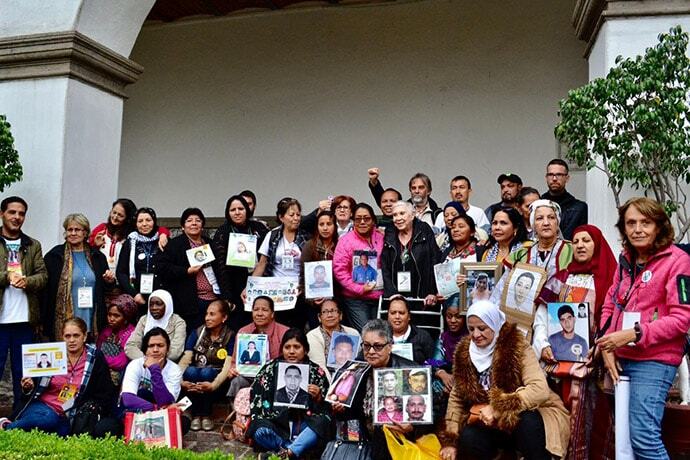 Early this November, I represented Seattle International Foundation at the first Global Summit of Mothers of Missing Migrants (Cumbre Mundial de Madres de Migrantes Desaparecidos) in Mexico City. Each year, a Caravan of Mothers* of Missing Migrants travels from Central America into and across Mexico along migration routes, searching for their children and family members who went missing trying to reach the U.S. For the first time, mothers from other continents joined members of this Caravan of Mothers for a historical summit to share stories, build ties, and work collaboratively to shed light on the efforts of families searching for their missing relatives. Longtime activist Marta Sanchez has been organizing the Caravan of Mothers since 2005 – to date the Caravan has recovered over 250 missing relatives, many of them deceased. During its annual search, the Caravan also raises awareness about risks and dangers faced by migrants on their journey north. In 2006, Sanchez founded the Movimiento Migrante Mesoamericano (MMM), a Mexican NGO that accompanies the Caravan each year and is the organizer of the Summit. The Global Summit of Mothers of Missing Migrants was part of the eighth annual World Social Forum on Migration (Foro Social Mundial de las Migraciones, FSMM), a meeting space to discuss global challenges in migration and make the struggles experienced by various populations visible. The Forum focused around seven thematic areas, encompassing 105 activities, and attracted over 1,000 participants from 66 countries. The timing and location of the Summit was impeccable – the weekend that hundreds of members of the migrant caravan arrived in Mexico City. The Mexican authorities expected between 5,000 and 6,000 migrants to arrive and set up a camp in a sports stadium near the airport to house the travelers. Various organizations coordinated to provide shelter, food and legal aid. Migrant caravans occur every year, as there is safety in numbers and the journey north presents a host of dangers such as violence, kidnapping, extortion, and dehydration. However, this year’s caravan is the largest to date – a symptom of the harsh reality lived by many in the region. Born in mid-October in Honduras, the caravan began with a group of 160 people that grew each day. U.S. President Donald Trump has used the caravan to drive an anti-immigrant agenda preceding mid-term elections, calling it an “invasion” and sending thousands of troops to the U.S.-Mexico border. On November 9, President Trump signed a presidential proclamation barring migrants who enter the U.S. unlawfully from seeking asylum. In December 2017, the Trump Administration pulled the U.S. out of the UN Global Compact on Migration, saying that it is inconsistent with U.S. sovereignty and immigration and refugee policies. The Global Compact on Migration (also known as the Global Compact for Safe, Orderly and Regular Migration) is an agreement negotiated by 192 countries to preserve the basic human rights of all migrants. The Agreement was finalized in July 2018 without U.S. participation, and will be formally adopted next month. The message of FSMM was that the Compact is still inadequate and does not drive the necessary action to meaningfully address the migration crisis and the dehumanization and human rights abuses that the crisis sustains. The Summit intended to contextualize the issue of forced displacement and migration further by discussing missing migrants and disappeared people specifically, and the obstacles faced by those looking for them – such as poor or non-existent government policies and protocols in searching for and identifying disappeared persons. The event also focused on the causes of forced migration and displacement, such as the War on Drugs, mega projects, rampant violence, corruption and institutionalized crime. Delegations of mothers from 13 different countries (Mexico, Guatemala, El Salvador, Nicaragua, Honduras, Spain, Italy, Algeria, Tunisia, Senegal, Morocco, Mauritania and the United States) drove the three-day event (Nov 2-4), while other participants took on the role of observers. Each delegation represented associations, committees and collectives dedicated to looking for missing relatives. Marta Sanchez guided the event, which kicked off with a round of introductions, after which the delegations split into working groups to exchange experiences and articulate a list of concrete actions to advance their work. On the final day of the Summit, all of the regional delegations reunited to summarize the conclusions from each of the three working groups, calling for the consolidation and strengthening of the worldwide efforts to locate missing migrants and those who have been forcibly disappeared, and a proposal for an online platform to coordinate these efforts. To finalize the Summit, the delegations together drafted a manifesto that calls on the international community and their respective governments to pay attention to their plight and to prevent more disappearances. A right to truth and establishment of the facts. I left the Summit at once feeling inspired and invigorated by the conversations and the work realized at the event and overwhelmed with the long way we have to go. Migration will not end – so long as there are conflicts, violations of human rights, famine, migration will endure. We are witnessing the highest levels of displacement on record, with 65.6 million people forced from home by conflict and persecution by the end of 2016. Government responses have been inadequate. I am heartened to see civil society stepping in to fill the gap and provide support to some of the most vulnerable among us, and deeply saddened by the fact that there are mothers all over the world looking for their missing children – mothers who ask their government for help and are met with indifference. These women have taken matters into their own hands. They have found each other, organized and begun making noise. The question is: when will government listen? 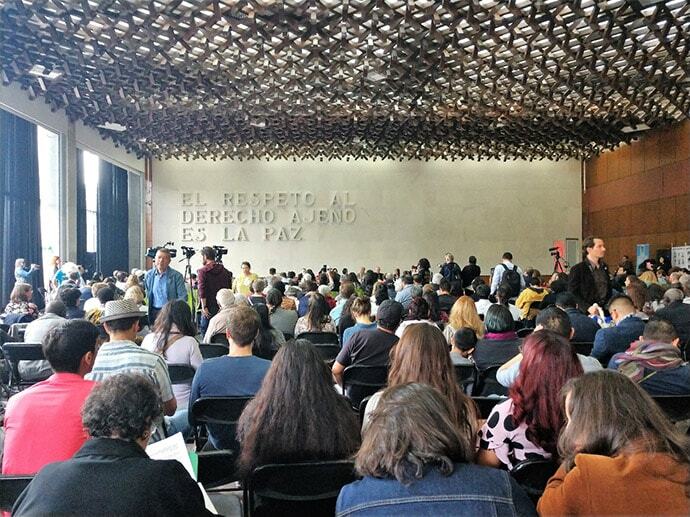 In the meantime, what we can all do is work to hold our governments accountable while supporting the efforts of civil society organizations like Movimiento Migrante Mesoamericano and important spaces for learning and dialogue such as the Summit. * “Caravan of Mothers” is a bit of a misnomer, as it also includes sisters, wives, and occasionally fathers and brothers searching for their missing siblings and spouses.